Keller et al. (2012): Iceman (5kya) looks Sardinian! Was this a fluke? Skoglund et al. (2012): No, because... Swedish farmer (5kya) looked Sardinian too! When did these "Sardinians" come to Europe? Lazaridis et al. (2014): No later than an LBK farmer from Germany (7kya) but what about western Europe? Olalde, Schroeder et al. (2015): Ditto for Mediterranean Spain! So where did they all come from? Mathieson et al. (2015): Anatolia! Hofmanová, Kreutzer et al. (2015): via Greece! Ancient DNA makes it possible to observe natural selection directly by analysing samples from populations before, during and after adaptation events. 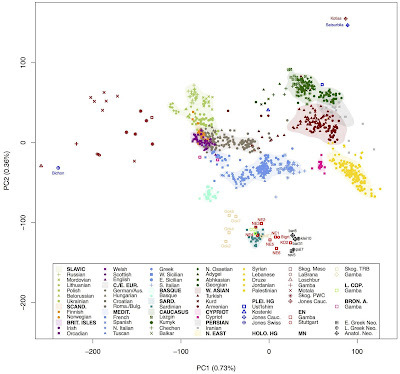 Here we report a genome-wide scan for selection using ancient DNA, capitalizing on the largest ancient DNA data set yet assembled: 230 West Eurasians who lived between 6500 and 300 BC, including 163 with newly reported data. The new samples include, to our knowledge, the first genome-wide ancient DNA from Anatolian Neolithic farmers, whose genetic material we obtained by extracting from petrous bones, and who we show were members of the population that was the source of Europe’s first farmers. We also report a transect of the steppe region in Samara between 5600 and 300 BC, which allows us to identify admixture into the steppe from at least two external sources. We detect selection at loci associated with diet, pigmentation and immunity, and two independent episodes of selection on height. Farming and sedentism first appear in southwest Asia during the early Holocene and later spread to neighboring regions, including Europe, along multiple dispersal routes. Conspicuous uncertainties remain about the relative roles of migration, cultural diffusion and admixture with local foragers in the early Neolithisation of Europe. Here we present paleogenomic data for five Neolithic individuals from northwestern Turkey and northern Greece, spanning the time and region of the earliest spread of farming into Europe. We observe striking genetic similarity both among Aegean early farmers and with those from across Europe. Our study demonstrates a direct genetic link between Mediterranean and Central European early farmers and those of Greece and Anatolia, extending the European Neolithic migratory chain all the way back to southwestern Asia. Susanna Sawyer, Gabriel Renaud et al. Denisovans, a sister group of Neandertals, have been described on the basis of a nuclear genome sequence from a finger phalanx (Denisova 3) found in Denisova Cave in the Altai Mountains. The only other Denisovan specimen described to date is a molar (Denisova 4) found at the same site. This tooth carries a mtDNA sequence similar to that of Denisova 3. Here we present nuclear DNA sequences from Denisova 4 and a morphological description, as well as mitochondrial and nuclear DNA sequence data, from another molar (Denisova 8) found in Denisova Cave in 2010. This new molar is similar to Denisova 4 in being very large and lacking traits typical of Neandertals and modern humans. Nuclear DNA sequences from the two molars form a clade with Denisova 3. 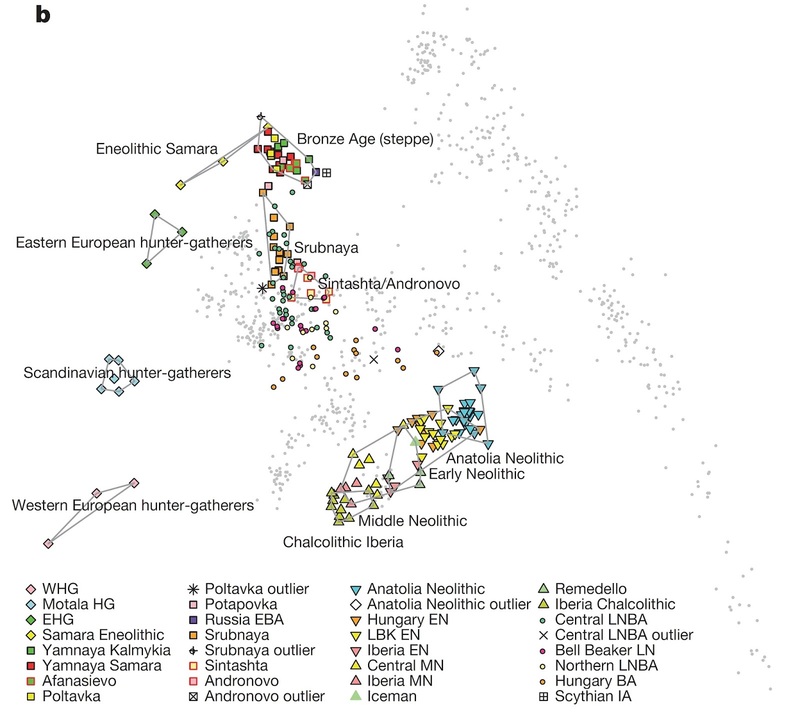 The mtDNA of Denisova 8 is more diverged and has accumulated fewer substitutions than the mtDNAs of the other two specimens, suggesting Denisovans were present in the region over an extended period. The nuclear DNA sequence diversity among the three Denisovans is comparable to that among six Neandertals, but lower than that among present-day humans. Years ago, I detected the presence of a West_Asian genetic component (with dual modes in "Caucasus" and "Gedrosia") whose origins I placed in the "highlands of West Asia" and which I proposed spread into Europe post-5kya with Indo-European languages. Earlier this year, the study by Haak et al. 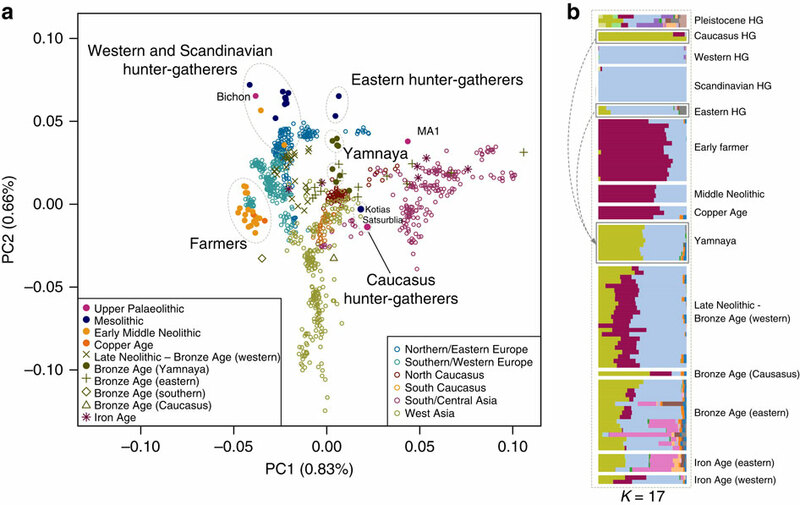 showed that steppe invaders after 5kya brought into Europe a 50/50 mix of "Eastern European Hunter-Gatherer" (EHG) ancestry/An unknown population from the Near East/Caucasus. The "unknown population" was most similar to Caucasians/Near Easterners like Armenians but did not correspond to any ancient sample. 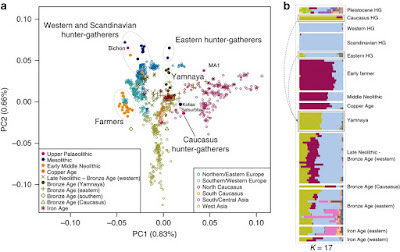 The separation between CHG and both EF and WHG ended during the Early Bronze Age when a major ancestral component linked to CHG was carried west by migrating herders from the Eurasian Steppe. The foundation group for this seismic change was the Yamnaya, who we estimate to owe half of their ancestry to CHG-linked sources. In modern populations, the impact of CHG also stretches beyond Europe to the east. Central and South Asian populations received genetic influx from CHG (or a population close to them), as shown by a prominent CHG component in ADMIXTURE (Supplementary Fig. 5; Supplementary Note 9) and admixture f3-statistics, which show many samples as a mix of CHG and another South Asian population (Fig. 4b; Supplementary Table 9). 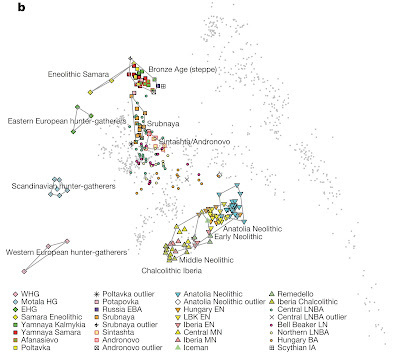 Both Georgian hunter-gatherer samples were assigned to haplogroup J with Kotias belonging to the subhaplogroup J2a (see methods). The paper is open access, so go ahead and read it for other details. Eppie R. Jones et al. The distribution of the pairwise Fst distances between all population pairs is shown in Supplementary Table S3. The genetic distance between Southern and Northern Italians (Fst=0.0013) is comparable to that between individuals living in different political units (ie, Iberians-Romanians Fst=0.0011; British-French Fst=0.0007), and, interestingly, in >50% of all the possible pairwise comparisons within Europe (Supplementary Figure S7). Recent scientific literature has highlighted the relevance of population genetic studies both for disease association mapping in admixed populations and for understanding the history of human migrations. Deeper insight into the history of the Italian population is critical for understanding the peopling of Europe. Because of its crucial position at the centre of the Mediterranean basin, the Italian peninsula has experienced a complex history of colonization and migration whose genetic signatures are still present in contemporary Italians. 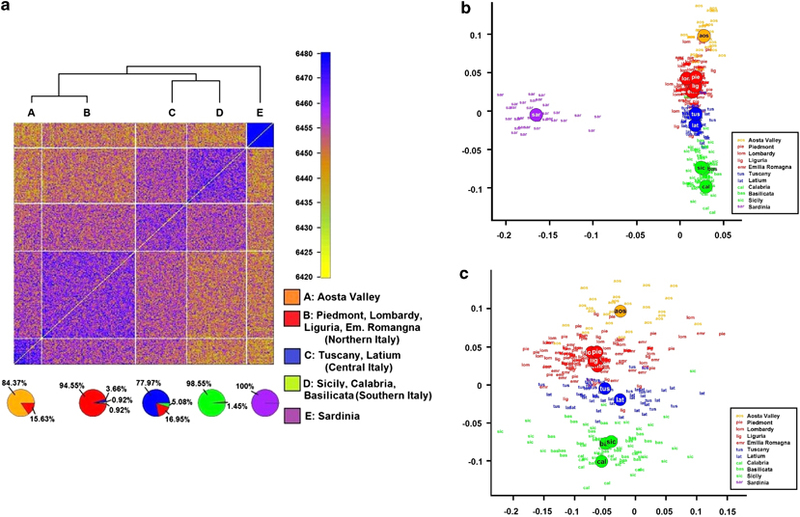 In this study, we investigated genomic variation in the Italian population using 2.5 million single-nucleotide polymorphisms in a sample of more than 300 unrelated Italian subjects with well-defined geographical origins. We combined several analytical approaches to interpret genome-wide data on 1272 individuals from European, Middle Eastern, and North African populations. We detected three major ancestral components contributing different proportions across the Italian peninsula, and signatures of continuous gene flow within Italy, which have produced remarkable genetic variability among contemporary Italians. 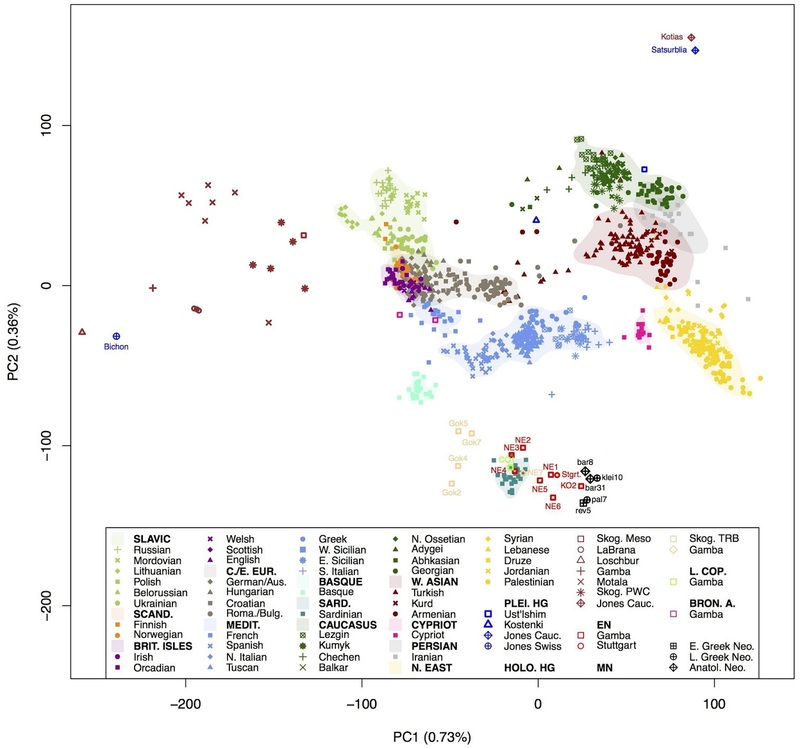 In addition, we have extracted novel details about the Italian population’s ancestry, identifying the genetic signatures of major historical events in Europe and the Mediterranean basin from the Neolithic (e.g., peopling of Sardinia) to recent times (e.g., ‘barbarian invasion’ of Northern and Central Italy). These results are valuable for further genetic, epidemiological and forensic studies in Italy and in Europe. Sampled Neandertals (from Europe, the Caucasus, and Siberia) certainly had lower effective population size than living humans, but I wonder what the comparison would be between ancient tribes of modern humans and Neandertals in the Near East where admixture presumably took place.